I enjoy jamming a lot. My goal is to get better with speed and to become a better blocker as well. HardLee and Dovah on the track inspire me the most. I want to be able to do what they do on the track. They make it look so easy and pretty. My first Freshie bout. I was confused and trying to understand what was going on, but I stuck to people and managed the best I could. And my team won! Yaaay!! The dragon is my spirit animal, a reminder that I am stronger than I think I am. I love anything that has to do with flight and I can definitely spit fire if I want! Naming myself after a Night Fury, a very unique and powerful dragon, also speaks to my love for movies and children (I’m a teacher and a mom). Blocker. I am strong in a wall and I love how we have to depend on each other to kill the dreams of the jammer! I still feel I have a lot to learn about the amazing sport, but each practice helps me feel a little stronger. I’m challenged to be a better skater and a better teammate because of the people in this league. A huge goal of mine is to be seen as a force to be reckoned with. I want to be good enough that others are nervous when I'm in the pack. Killo may have high expectations, but she pushes you and makes you feel like you can do anything if you work hard enough. And Moose has given me the path toward extreme blocking skills and helps get me out of my head to just enjoy the game of derby. The home team tournament a couple of months ago! It was my first home team game with the amazing Topanga Maulrats. At one point, I found myself in front of Kat Von Reap and actually containing her. It was great because I could feel myself improving with each passing game. 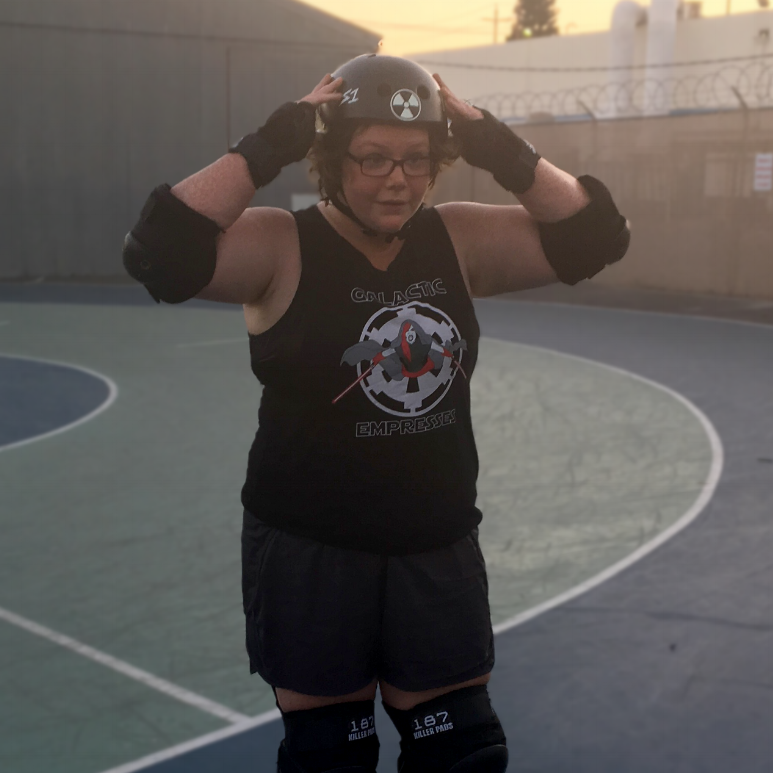 It was terrifying and exhilarating to play with the OMGs and everyone else in the league — and the best part was the Maulrats won! I AM stronger than I thought I was. I CAN be a member of a team. I CAN lift others up too and make a difference. I am still growing, but I will never regret trying out this crazy sport. I will never quit.